These are all suggestive themes, requiring, to persuade the viewer, a strong syntax of forms – a cohering rhythm of color and line. And these paintings certainly persuade. Rosenthal’s colors build with supple assurance, rendering tangible these highly imagined worlds. In “Silent” (2013) the sequences of color (a cool terracotta sounding against dense blues, an ethereal light blue and a jewel-like blue-green) by themselves express the deep, bright stillness encompassing foreground roofs, distant sunlit peaks, and a crystalline structure in-between – all of these beneath a lowering sky. A small, angular configuration of shapes at the canvas’ lower edge – surely a figure – stands beneath the up-close buildings, appearing to survey the unfolding panorama, much as we do from without the painting's frame. Pictorially, the canvas possesses an expansiveness that belies its physical dimensions. Hanging alongside this canvas, “Fête” (2103) revisits the motif, though with somewhat looser brushwork and heightened hues of orange and pale scarlet. But there are conspicuous shifts in the subject matter, too. 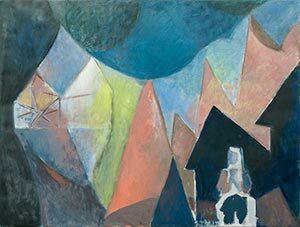 The foreground figure now reclines, “Arcadia-style,” while the foreground roofs have turned into a more anomalous dark: the mountains become the true shelter. Meanwhile, a second figure stands at the entrance to the distant structure, signaling its accessibility. In this vision, people not only apprise nature but move freely through it. As in “Silent,” the artist creates distances and proximities not with the simple expedient of canvas-inches, but rhythmically, through the relationships of forms. Several works in the show take these compositional shifts a step further, with side-by-side repetitions of scenes – or perhaps “re-inventions” might be the better word, as the colors in the second images are often inverted (warm for cool, light for dark), while their loose drawing precludes any sense of mechanistic echoing. In “Doubled Landscape (Familiar Sights)” (2011), a stand-out work that also appeared a previous Bowery exhibition, both halves of the canvas depict houses clambering up a steep hill, with churning masses of trees/hills in the foreground, and great arcs of clouds sweeping behind. But each half feels independent, evoking a transformational duality: day/night, perhaps, or past/present or reality/dream. In “Country Matters” (2014), two figures work their ways through different areas of a tapestry of curving facets of cerulean, cobalt, and purplish-blue. Tent-like forms of warm off-whites anchor the ground plane, while flares of light orange punctuate the sky/background. Are the pale forms really tents? Are the orange streaks evening sky, or a cabin’s welcoming light? No need to know; we sense nature, made animate and mysterious, within the unique language of paint.